taganrogcity.com | Taganrog Municipal Choir "LIK"
The chamber choir LIK was founded in 1992 and its current line-up consists of 28 people (14 male and 14 female voices) - all of them choral singing teachers and music school students and graduates from Taganrog and Rostov Oblast. Every year the group gives some 50 concerts in the region, nationwide and abroad. In 2015 the Chamber Choir LIK won the Southern Federal District's stage of All-Russian Choir Festival in category "Professional Groups". 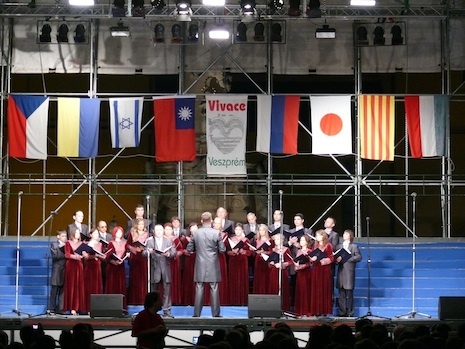 Choir Lik performing at Vivace Festival in Veszprém, Hungary in 2011. The choir's current repertoire features all music styles and genres in ten world's languages, including canticles, contemporary part songs, classic literature masterpieces, jazz adaptations, folk songs and opera parts. Among the best works performed by the group are: "All-Night Vigil" and "Liturgy" by Sergei Rachmaninoff, requiems by Wolfgang Amadeus Mozart, Giuseppe Verdi and Andrew Lloyd Webber, choral symphony of action "Perezvony" ("Chimes") by Valery Gavrilin, cantatas "Carmina Burana" by Carl Orff, "Gloria" by Antonio Vivaldi and "Pathetic Oratorio" by Georgy Sviridov. The ability to use various singing styles, switching back and forth between different styles of performance open many artistic opportunities and reflect on LIK's projects and concert programs. The chorus artistic director is Mr. Alexey Loginov - an honored artist of the All-Russian Music Society, whose enthusiasm as promoter and choirmaster helped the group to achieve a new professional level. Taganrog Municipal Choir LIK has participated in many international events, including International festival "Badische Sonne" (Germany-France) in 2007, International festival "Barbershop Harmony" (Saint-Petersburg, Russia) in 2008, All-Russian choral festival "Neva Choral Assemblies" (Saint-Petersburg, Russia) in 2008, in Vivace International Choir Festival (Veszprém, Hungary) in 2011, International Chekhov Forum (Badenweiler, Germany) in 2004, 2006, 2008, 2011 and 2012. LIK performs n Wartberg an der Krems, Austria.